Hey all! Welcome back! 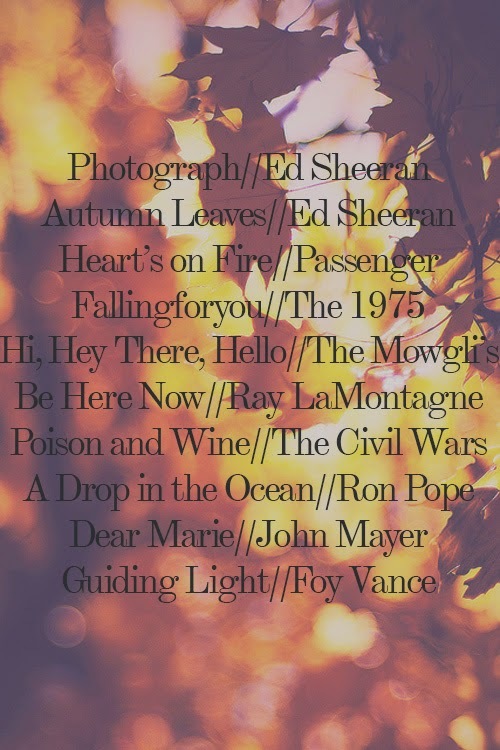 Today on le blog I'm going to be sharing with you my fall playlist! My music taste is all over the boards. I can go from listening to Taylor Swift's 'Shake It Off' to The 1975's 'Settle Down' in about .02 seconds. I think I definitely have an eclectic music taste to say the least. Lol. Recently I've been into more indie and slower tunes. Songs with meaningful lyrics and more of an acoustic vibe. I'll sit and drink my coffee snuggled in bed scrolling through Instagram while playing my Fall Playlist. It's bliss. So what's on my fall playlist? These have been the songs I've been really into recently and I even have a playlist on Spotify if you wanna check them and a few more out! Ed Sheeran is one that I have a lot of songs of his because he's just amazing. I have some Echosmith, Ben Rector, Florence and the Machines and tons of other artists who are some of my fave! Head on over and check it out!